Siberia enjoys a well-deserved reputation as one of the coldest places on Earth. But the last time the planet got really cold, Siberia apparently didn't go along for the ride, providing animals a warm oasis from the Ice Age. That's the finding of Eva Bellemain of the University of Oslo, who recently presented her analysis of DNA found in the Siberian permafrost that dates back 15,000 to 20,000 years ago. During that time, much of the northern hemisphere was engulfed in massive glaciers, but it appears this part of Siberia escaped this, instead becoming a refuge for wildlife. The diversity of fungi found suggests that a brimming plant community thrived in northern Siberia to support them. This range of plants should also have sustained a diverse assembly of mammals - and the samples indeed contain DNA from woolly rhinoceros (Coelodonta antiquitatis), woolly mammoths (Mammuthus primigenius), reindeer (Rangifer tarandus) and moose (Alces alces) dating back to between 15,000 and 25,000 years ago. But why did Siberia emerge as a bright spot of (relative) warmth in the Ice Age? Obviously, escaping the huge glaciation was crucial, and at that point the basic inertia of the ecosystem was probably enough to keep it thriving for thousands of years, even as the rest of the hemisphere lay frozen. Check out New Scientist for more. Original paper at Molecular Ecology. 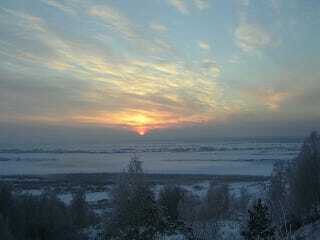 Image of present-day Siberia by Olga Oslina on Flickr.